For black holes, there appears to be very little room for mediocrity, astronomers have found. A study suggests they come in either small or large sizes, but medium-sized ones are very rare or non-existent. A team of astronomers has examined one of the best hiding places for a middleweight black hole, and found that it cannot possibly host one. Details of the research are to be published in the latest issue of the Astrophysical Journal. Black holes are incredibly dense points of matter, where gravity prevents even light from escaping. The least massive black holes known are about 10 times the mass of our Sun and form when colossal stars explode as supernovas. The heftiest black holes are billions of times the mass of the Sun and lie deep in the bellies of almost all galaxies. That leaves black holes of intermediate mass, which were thought to be buried at the cores of globular clusters. Globular clusters are dense collections of millions of stars, which reside within galaxies containing hundreds of billions of stars. Theorists argue that these clusters should have a scaled-down version of the supermassive black holes found at the centre of galaxies. Such objects would be about 1,000 to 10,000 times the mass of the Sun - medium-sized as far as black holes are concerned. 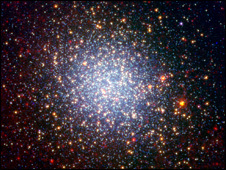 Now, a team of astronomers led by Stephen Zepf of Michigan State University, East Lansing, has carried out a detailed examination of a globular cluster called RZ2109. The researchers' work led them to the conclusion that it could not possess a medium-sized black hole. "Some theories say that small black holes in globular clusters should sink down to the centre and form a medium-sized one, but our discovery suggests this isn't true," said co-author Daniel Stern of Nasa's Jet Propulsion Laboratory in Pasadena, California. In a previous study, Dr Zepf and his colleagues looked for evidence of a black hole in RZ2109, located 50 million light-years away in a nearby galaxy. Using the European Space Agency's (Esa) XMM-Newton telescope, they discovered the telltale X-ray signature of an active, or "feeding", black hole. But, at that point, they still didn't know its size. Stephen Zepf and Daniel Stern then teamed up with other researchers to obtain a chemical fingerprint, called a spectrum, of the globular cluster, using the WM Keck Observatory on Mauna Kea in Hawaii. The spectrum revealed that the black hole is petite, with roughly 10 times the mass of the Sun. According to theory, a cluster with a small black hole cannot have a medium one, too. "If a medium black hole existed in a cluster, it would either swallow little black holes or kick them out of the cluster," said Dr Stern. In other words, the small black hole in RZ2109 rules out the possibility of a medium one being there, too. The study does not quite represent the end of the road for medium-sized black holes. Zepf said it was possible such objects were hiding in the outskirts of galaxies like our Milky Way, either in surrounding "dwarf galaxies" or in the remnants of dwarf galaxies being swallowed by a bigger one. If so, he said, the black holes would be faint and difficult to find.